Dubey, S.K. and Sharma, D. 2018. Assessment of climate change impact on yield of major crops in the Banas River Basin, India. Science of the Total Environment 635: 10-19. One of the more frequently cited claims of climate alarmists when it comes to the future of agricultural production is that CO2-induced climate change will negatively impact crop yields. Such claims were historically based on rather crude models that often failed to include farmer adaptation (e.g., crop variety selection or planting date) or the beneficial impacts of rising atmospheric CO2 concentrations on crop growth. However, as the models have improved in recent years and become much more realistic, the negative projections of future yield reductions have begun to disappear (see for example The Influence of Farmer Adaptation in Maize Production Projections, Projecting the Impacts of Rising CO2 on Future Crop Yields in Germany, Technological Progress vs. Atmospheric CO2 Enrichment and Calculating the Effects of Climate Change and Atmospheric CO2 Enrichment on California (USA) Crop Production). The latest study to chip away at this outdated claim comes from Dubey and Sharma (2018). As their contribution to the subject, the two Indian researchers used the AquaCrop model to estimate the impact of climate change on the yield of three major crops (wheat, barley and maize) in the semi-arid region of Rajasthan state in India. In doing so, the authors first calibrated their model using observational data over the 30-year historical period 1981-2010. Next, they produced yield estimates for these crops for the period 2021-2050 based on the IPCC's RCP4.5 and RCP 8.5 climate change scenarios. In the two scenarios, the projected rise in maximum and minimum temperatures varied from 0.5 °C to 0.8 °C (RCP4.5) and 1.37 °C to 1.3 °C (RCP8.5), precipitation declined a maximum of 45.9 mm (RCP4.5) and 21.9 mm (RCP8.5), and atmospheric CO2 concentration rose by 86.34 ppm (RCP4.5) and 110.34 ppm (RCP8.5). And what did the projections reveal? As indicated in the figure below, yields of all three crops increased in the 2021-2050 period relative to the baseline 1981-2010 historical period. More specifically, in the RCP4.5 climate scenario, despite a decline in precipitation and a rise in temperature and elevated CO2, wheat yields increased by 66.8%, maize yields rose by 7.1% and barley yields improved by 49.9%. 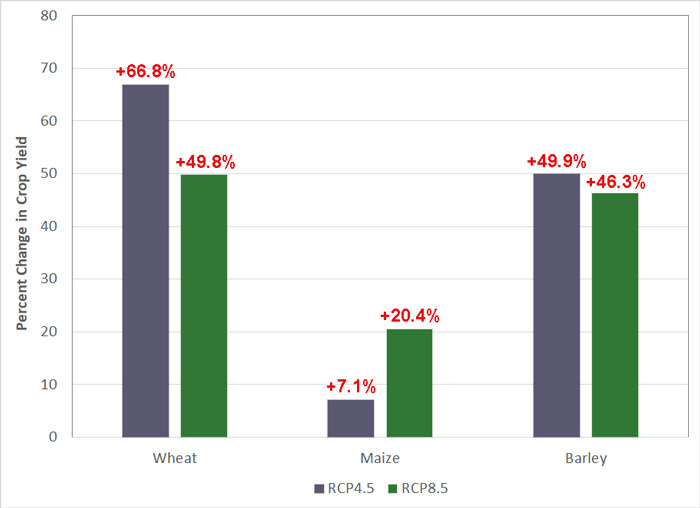 Similarly in the RCP8.5 model scenario, yields of wheat, maize and barley increased by 49.8%, 20.4% and 46.3%, respectively. Commenting on these findings, Dubey and Sharma state the obvious, that "the impact of RCP4.5 and RCP8.5 scenarios on wheat, barley and maize growth reveals a progressive increase trend of the crops." They also note that "regional projections with crop models can be improved by using more information from field data" as they demonstrated in their analysis. And that improvement reveals very encouraging news for the stability of future food security in this developing country of well over a billion persons, thanks in large measure to the beneficial impacts associated with the aerial fertilization effect of rising atmospheric CO2. Figure 1. Percent change in crop yield for wheat, maize and barley (relative to the baseline period 1981-2010) based on changes in climate (temperature and precipitation) and atmospheric CO2 as predicted for the Banas River Basin of India by IPCC model scenarios RCP4.5 and RCP8.5 for the period 2021-2050.